Gong Bath and Sound Meditation – North London 11th April 2016 focusing on Letting Go! This month’s gong will be a little different. We will be focusing on Letting Go! and expect a little movement at the start! Nothing too strenuous, I promise 🙂 Letting go of that which no longer serves us. For availability and bookings please scroll to the bottom of the page. Please note we are usually full in advance. The sounds that come out of the gongs are very unfathomable and very difficult for the human brain to follow, this results in surrender, and you will drift into a deep meditative state, this can happen once or many times throughout a session, everyone can have a different experience. Every session is different. 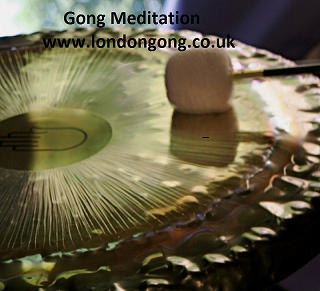 During the Sound Bath you will hear various sounds from Gong and other soothing instruments. Gong baths are very good to aid stress relief. £15.00 per person. Important – Please arrive by 7.15pm latest allowing ample time for settling in and a little quiet time before we start. I recommend you arrive a little earlier with time to relax for the best experience. Once the Gong Bath starts at 7.30pm, the doors are closed and it will not be possible for latecomers to gain entry. We can be found on the first floor at the Creative Space within the Arts Depot, North Finchley’s premier art space. Artsdepot is fully accessible to wheelchair users with step free access throughout. Multiple lifts provide access to all floors. If you arrive early, feel free to relax in the comfy Cafe area. Finding the Venue https://www.artsdepot.co.uk/getting-here . If using a Sat Nav, please use postcode N12 0EH instead!!!! or your sat nave may lead you astray. When you purchase your ticket you will be asked to agree to our Terms and Conditions.